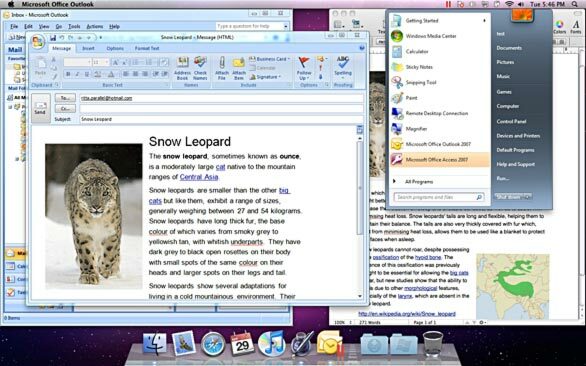 Parallels announced Wednesday that Parallels Desktop 5 for Mac is now available. The latest release of the virtualization solution allows users to run Windows, Linux, and other operating systems on their Intel-based Macs. Parallels Desktop 5 works in both Leopard and Snow Leopard. Version 5 ($80; upgrades, $50) includes more than 70 new features targeted at making the program faster, smarter, and more powerful. In the “faster” category, Parallels Desktop 5 now includes full Aero support in Windows Vista and Windows 7, and an improved Parallels Transporter promises to speed up and ease the task of converting a standalone PC into a Parallels virtual machine. USB transfer speeds in Windows are faster than before, and Parallels Compressor runs in the background to optimize the size of the virtual machine for better performance. “Smarter” features include a more Mac-like experience through a new Crystal view mode, which basically makes the Windows operating system disappear—Parallels’ icon vanishes from the Dock and application switcher, and it’s replaced with a Parallels icon in the menu bar. Click that icon to gain access to the Windows start menu, and a folder in the Dock provides access to Windows applications. There’s even an optional MacLook mode that attempts to make Windows’ windows look more like those in OS X—squared corners are rounded off, and the close/zoom buttons are replaced with the standard OS X colored versions. Parallels Desktop also supports pinch and swipe gestures in many applications. You can, for instance, change the zoom level on a Word for Windows document by pinching in or out on your trackpad. You can also copy and paste formatted text and images between not just the Mac OS and Windows, but with Linux as well. Multiple monitor support has been improved as well, making it easier to use Windows and Linux applications on multi-monitor Macs. Parallels Desktop’s virtual machine configuration interface has been streamlined, making it simpler to find the settings you wish to change. Both Windows and Linux guest operating systems can be installed via an easy installer, and Parallels supports up to eight virtual CPUs, and 64-bit versions of Windows and Mac OS X Server. Some of the more "powerful” features are OpenGL 2.1 acceleration, not just in Windows but also in Linux. Parallels says that graphics performance in games and 3D applications is seven times better than the prior version of Parallels, and a revised interface gives users greater power over their virtual machines. Using a new floating virtual machine window, users can control the order of the machines in the list, apply custom colors, and see snapshots of activity on each virtual machine. The new Crystal mode hides the Parallels Dock icon and menu-bar entries—a new menu-bar icon and docked folder provide access to Windows' Start menu and applications. Users can now compress or expand the size of the virtual machine’s hard drive directly from within the program; no external application is required. The program also includes Smart Card reader support, for those businesses using this security technology. For those who wish to test drive Windows, Parallels will be making virtual appliances available that include trial versions of the various Windows operating systems. Parallels Desktop 5 includes a bundle of Windows software, featuring a 12-month subscription to Parallels Internet Security by Kaspersky; Acronis Disk Director, a suite of disk management tools; and Acronis True Image, tools to help ease data backup and recovery. The program is currently available in five languages (English, German, French, Italian, Spanish) with versions in Chinese, Czech, Hungarian, Japanese, Polish, and Russian due out in the near future. You can find it at the Parallels Online Store, the Apple Store (both online and retail), Amazon.com, Best Buy, Fry’s Electronics, Target, and many other retail locations. Users who purchased the current version of Parallels after October 1st qualify for a free upgrade—if you purchased from the Parallels Online Store, you’ll receive a key directly from Parallels. 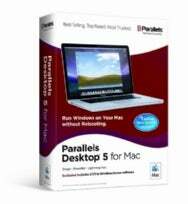 Users who purchased at other locations will need to visit the Parallels Desktop for Mac 5 free upgrade page to get their keys.